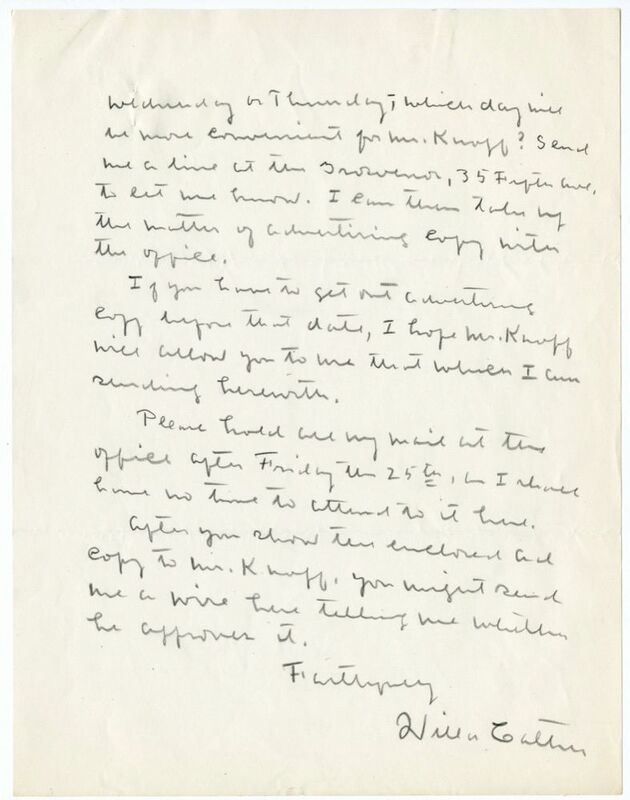 I am sending you the copy I would like you to use for general advertising; please bring both the copy and this letter to the attention of Mr. Samuel Knopf3,—as I take it for granted he is in charge of the office. The book4 has had a rather unusual history, and that is the reason for this new edition. Why not simply tell what the book has done for itself? There is nothing in this ad copy that is not true,—it understates rather than over-states. I think it will interest people and will be read. I will be in New York5 on Wednesday the 30th, and will go to the office on Wednesday or Thursday,—which day will be more convenient for Mr. Knopf? Send me a line6 at the Grosvenor7, 35 Fifth Ave, to let me know. I can then take up the matter of advertising copy with the office. If you have to get out advertising copy before that date, I hope Mr. Knopf will allow you to use that which I am sending herewith. Please hold all my mail at the office after Friday the 25th, as I shall have no time to attend to it here. After you show the enclosed ad copy to Mr. Knopf, you might send me a wire here telling me whether he approves it8. October 24, 1929, is the Thursday before this letter was stamped as received on October 25, 1929. 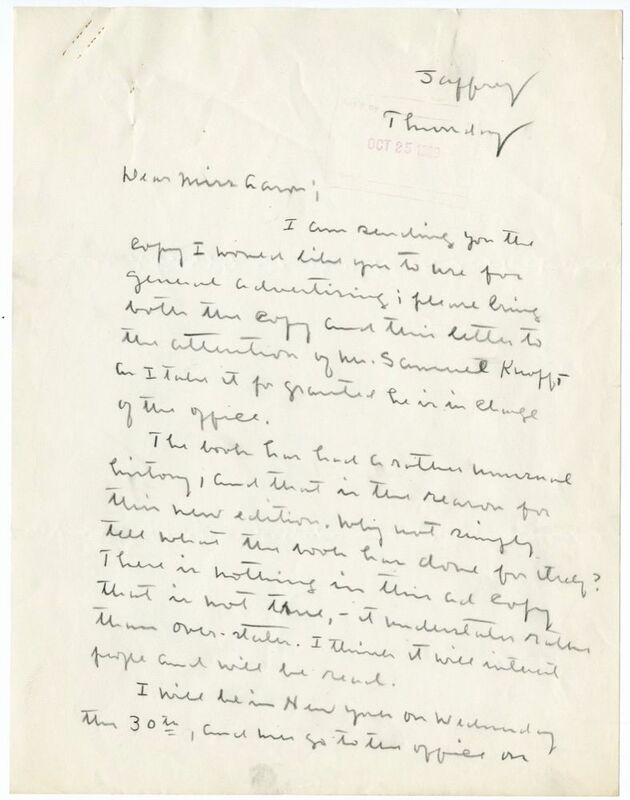 On 28 October 1929, Aaron wrote Cather that Samuel Knopf would be glad to see her when she returned to New York City. Knopf, Samuel (1862-1932). Treasurer of Alfred A. Knopf, Inc. Born in Poland, Samuel Knopf’s family brought him to the United States as a child. He headed his own advertising agency until 1921, when his son Alfred’s publishing firm incorporated as Alfred A. Knopf, Inc. and he invested in the company and became its treasurer. 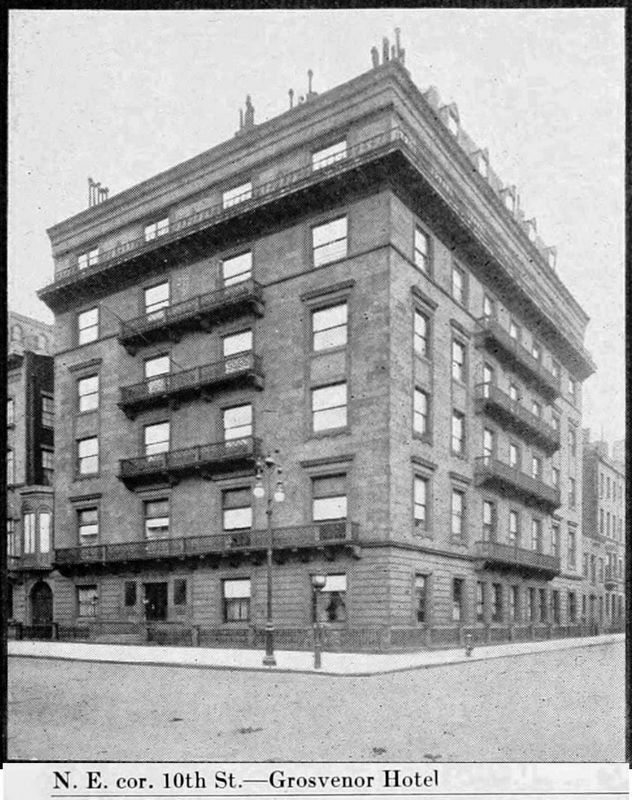 Active in the company’s affairs, especially management of its London office, he occasionally assumed responsibility for Cather’s affairs in the absence of Alfred and Blanche Knopf, and Cather came to know him personally during her frequent visits to the Knopf offices. When he died, she wrote to his son about the “absolute confidence” he inspired in her (#1672).